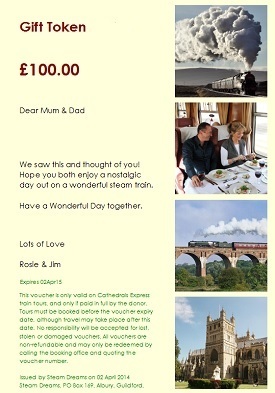 Treat your loved one to a Steam Dreams Gift Voucher to use on a steam train day out of their choice. With over 50 trips a year to choose from, from locations across the UK, there's something to suit everyone. You can personalise your Gift Voucher with a printed message, or use the space to write your own! We offer our Gift Vouchers in a range of values to suit all pockets. Starting at just £50, you can choose any value to suit your requirements. Your voucher will be valid for a full year from the day of purchase. That is, tours must be booked before the voucher expires, but travel can take place after this date. Call the Booking Office on 01483 209888 if you would like to purchase a Gift Voucher. We can post it out to you the same day, along with a free copy of our latest brochure. Vouchers can also be sent electronically and printed at home as a last minute gift! PLEASE NOTE: Steam Dreams Gift Vouchers cannot be used for third party bookings, for example ScotRail Steam Trips. Did you know, if you wanted to purchase tickets for a specific trip as a gift, for just £2 you can have gift tickets posted out to you? Gift tickets summarize the trip itinerary without prices and come in a special presentation wallet. Call the Booking Office on 01483 209888 to order gift tickets.